Sony’s smaller version of the Xperia Z3, the Xperia Z3 Compact, was a fantastic phone. It was the first time we saw a major manufacturer pack all the high-end goodness of a flagship phone into a smaller form package, and we liked what we saw. It offered the kind of specs you’d like to see in a flagship phone but in a package for those with dinkier hands that don’t want to be struggling around with a 5.2-inch monstrosity. The Xperia Z5 Compact wants to capitalise on that success and offer the exact same thing, but with some slightly improved specs. But even though the Xperia Z3 Compact was released this time last year, Sony’s new little phone isn’t offering all that much more. In terms of design, Sony has clearly taken some influence from the iPhone 5c and gone with bright colours but adapted it to keep a brushed metal feel. The corners are much more rounded last time meaning the handset feels a load better in your hand. On the front is a 4.6-inch 720p display that we are a little upset about; it’s about time Sony upped this to a Full HD display so it’d really boast flagship specs through and through. Design-wise it’s much better looking than last year’s edition with fewer flaps, the buttons are in better positions and the waterproof technology is still intact so you can even take it in the bath with you. It’s the perfect size to fit in the hand (it’s much the same as the iPhone 5c with your thumb being able to reach all over the screen), so it’s obvious why this phone has been so popular with those with smaller hands. Inside the Xperia Z5 Compact is the same Qualcomm Snapdragon 810 processor that overheated inside the Xperia Z3+ (the spec-bumped European version of the Xperia Z4) so there’s a little cause for concern, but Sony assures us the problems have all been sorted. There’s also 2GB of RAM, 32GB of storage and a huge 200GB of expandable microSD storage to optionally back it up. Battery was one of the many highlights on the last phone and it may just be the same again with a 2700mAh battery in the Xperia Z5 Compact. It comes with Android 5.1 Lollipop installed with Sony’s own overlay over the top – you either love it or you hate it, but this time Sony has taken quite a few elements from stock to make it a lot more attractive on the eye. Camera-wise there’s been some huge improvements with a 23MP sensor on the back, 4K video capture, a 24mm wide-angle lens and a new autofocus system that should mean your photos are even less likely to be blurry than they were before. On the front is a 5MP selfie shooter with another wide-angle lens and the chance to shoot in Full HD, even though you won’t be able to watch it back on the phone in that quality. 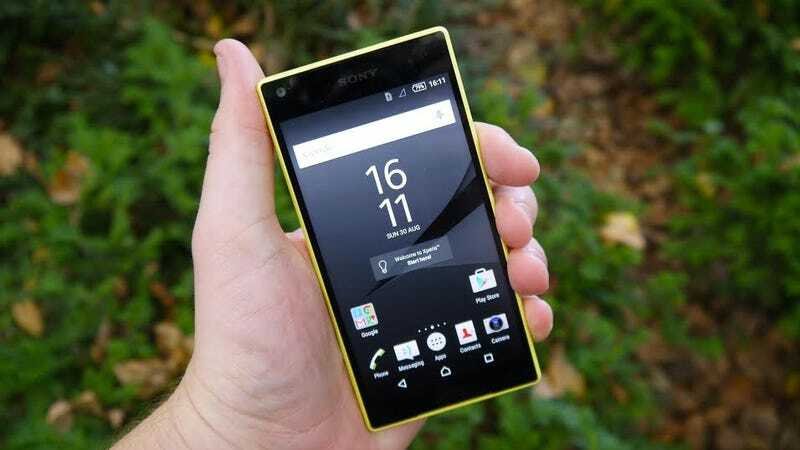 Overall the Sony Xperia Z5 is a much better small form factor than the rest of the market is offering. If you’re looking for a smaller device with some serious power behind it, there’s no where else to look apart from what Sony is doing here…and it looks great too.